Each year, European Health and Safety Week aims to promote good health and safety practice. 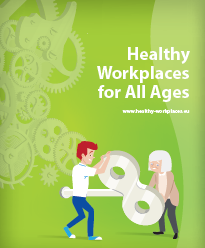 This year’s theme is Healthy Workplaces for All Ages. With increased life expectancy, no default retirement age, changes in pension age and provision, workers will continue to work as they age. At the same time, modern apprenticeship schemes may see more young people entering the workplace. Employers have responsibilities for the health, safety and welfare of all their employees. However, employers do need to consider vulnerable groups including younger, older, and women of child-bearing age. Working for longer, new technology and ways of working, may result in longer exposure to risks (whether muscular-skeletal or otherwise). There may be more workers with disabilities and long term health issues so measures such as rehabilitation and return to work will also be of increased importance. Good workplace design, and well managed health and safety, benefit all of us. • Cover the theme of healthy workplaces for all ages in your team meetings. • HSE European Health and Safety Week Campaign 2016. • HSE vulnerable workers page with links to information on older, young, and disabled workers; plus gender and maternity.